A Sankalp (vow) is taken by the devotees by taking water in the hands in front of the Goddess. The devotees drink this holy water through palms and then put a tilak on the forehead. 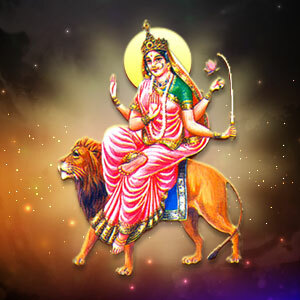 Then, they offer camphor mixed water, flowers, honey, ghee, cow milk, Panchamrit, sugar and clothes or saree to Goddess Katyayani and worship her earnestly to seek her blessings.